Comfort Inn & Suites Near Newpark Mall is located Newark, CA. 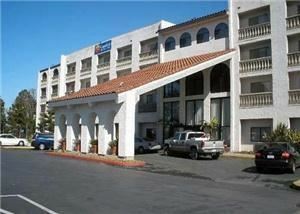 The Comfort Inn & Suites hotel is ideally located in the San Francisco Bay area of California. This Newark, CA hotel is just minutes from downtown San Jose and business, and research and development firms headquartered in the Silicon Valley like Adobe Systems, IBM Corporation and Sun Microsystems. Kaiser Permanente Health Insurance Company and the LAM Research corporate offices are also nearby. A number of entertainment venues, outdoor recreation areas and golf courses can be found in the surrounding area. Several retailers, specialty shops, restaurants and cocktail lounges are close to the hotel; some are within walking distance. Guests of this Newark, CA hotel can enjoy features and amenities like: Free continental breakfast, free daily newspaper, free wireless high-speed Internet access and Outdoor heated pool. The on-site business center provides access to modern conveniences like copy and fax service. This California hotel has two banquet and meeting rooms that can accommodate up to 163 people for most business or social functions.